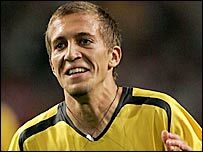 Teenage striker Arturo Lupoli was on target as Arsenal began the Amsterdam Tournament with a 1-0 win over Ajax. Captain Thierry Henry and new signing Alexander Hleb combined to find the Italian on the edge of the penalty area with just three minutes remaining. Lupoli, 18, controlled the ball and turned to send a rising left-foot shot into the net. Tournament hosts Ajax created several chances during the game but failed to convert any of them. Arsenal manager Arsene Wenger, who is trying to work out how best to compensate for the loss of Patrick Vieira, experimented with Robert Pires in a central midfield role. But Wenger stressed that using the Frenchman there in the Premiership was only one of several options under consideration. "Robert Pires is a good football player, so like every good footballer he can play everywhere. He's more of an offensive than a defensive player," Wenger told Sky Sports. "In pre-season you can try things. That's one of the luxuries you can have." Henry, who has succeeeded Vieira as club captain, said: "Lupoli came on and finished the job for us. "We did well as a team. It's a good thing for the beginning of the season." In the earlier match, Porto beat Argentine side Boca Juniors 2-0 with goals from Helder Postiga and Jorginho. Postiga's deflected shot beat Boca goalkeeper Roberto Abbondanzieri in the 19th minute before Hugo Almeida set up Jorginho for the second goal. Porto will take on Arsenal and Ajax face Boca in the final matches on Sunday. Teams are awarded three points for a win, one point for a draw and a point for every goal scored.